German Shepherds: What Nutrient Does Your Regal Pet Need? A German Shepherd is a breed of working dog originating from—you guessed it—Germany. Highly intelligent, athletic, and relatively easy to train, the German Shepherds are trained as police dogs, drug sniffing dogs, and dogs for the blind. The chances are, your German Shepherd’s job is a little less strenuous and involves mostly lounging around the house and being your best friend. Whether it is dry food or dog meat, like all dogs, German Shepherd puppies and adults alike benefit from high-quality dog food that has specific protein, fat, Omega fatty acids, and fiber content, as well as being enriched with particular vitamins and minerals. So, why don’t we feed them that way? Nulo Pet Food, Inc. - Misc. Many dog owners unknowingly take a one-size-fits-all approach when it comes to feeding their pets, especially if they have multiple ones, but German Shepherds and other breeds can really benefit from more targeted nutrition. So, what does that mean exactly? Well, let’s take a look! Being a high-energy breed, German Shepherds need to not only get enough exercise and mental stimulation to keep them healthy, but they also need to be consuming enough calories to sustain that energy. Having said this, German Shepherds are a breed that can pack on a few pounds, especially in their golden years, so you should get a dog food with high protein levels to support those energy levels but a more moderate fat content is ideal. makes weight management really important for your regal pup. You should also look for a food that contains glucosamine and chondroitin, which support joint health or other supplements like calcium or l-carnitine to keep bones healthy. As always, steer clear of cheap fillers such as wheat, corn, and soy. Although German Shepherds are less prone to allergies than some other breeds, they can have sensitive stomachs so it never hurts to steer clear of chicken as well. Calories intake is important to consider for an active breed that can be prone to weight gain such as a German Shepherd. Always talk to your vet to determine what he thinks is best for your pup. Puppies need to consume twice as many calories as an adult of the same breed. Not only do puppies have way higher energy levels (have you ever met a puppy? ), but they are also growing at a very quick rate. Puppies have to do in 1-2 years what humans do in 20 years when it comes to growing! Your German Shepherd puppy probably requires about 40 calories per lb per day. Therefore, if your puppy weighs 10 lb, he needs to be consuming about 400 calories a day. This might seem like a lot for your bouncing baby, but if you are feeding your puppy actual puppy food, it is an easily attainable feat. An adult German Shepherd’s calories intake will mostly depend on his activeness. A dog that sleeps in a crate all day will obviously require fewer calories than a dog who lives on a farm and spends all day running around outside. The typical adult will need about 20 calories per lb per day, half of what a puppy requires. So, for an average dog, you should ensure his diet provides around 1,400-1,500 calories per day. than the average dog, but not as much as a puppy. Somewhere between the two is about 30 calories per lb per day. So, an active dog needs about 2,100 calories a day to sustain his energy levels, as well as for physical and mental stamina. An older, more sedentary dog will probably self-moderate, but you should ensure that he is not over feeding. To prevent weight-related health problems, an older and slower dog probably only needs about 1,200 calories a day. All quality dog food will give you a breakdown of proteins, fats, and carbs in the crude analysis. No matter the breed, the first ingredient should ALWAYS be protein. Your dog may be a domestic little snuggle monster now but he descended from the gray wolf and is by nature a carnivore. Any biologically appropriate food will feature protein as the first ingredient on that Crude Analysis and if it doesn’t don’t buy it, no matter what fancy marketing is used to try to entice you. Since German Shepherds are high energy breeds, the protein should be around 20% for a fairly sedentary dog and between 30% and 40% for a more active working dog. Protein not only gives your dog energy, but will also assist in the development of strong, lean muscle. The next ingredient on that crude analysis is likely fat. Despite our warnings about your German Shepherd being prone to a little weight gain, don’t shy away from this ingredient. Your dog needs it. Not only does fat provide energy, but fatty acids will also help create a lipid barrier, for healthy skin and a smooth shiny coat. Fatty acids are also important for heart health and essential for your smart pooch’s cognitive function. You are ideally looking for a fat content between 12% and 18% for a German Shepherd. When we talk about carbohydrates in a dog’s diet, it is not as important to look at the amount of carbs but the source of the carbs. Although not as prone to allergies as some breeds like boxers or bulldogs, German Shepherds can still suffer from allergies. Therefore, it is important to look for a food that is ideally grain-free but definitely does not include wheat, soy, or corn. When we spoke about biological appropriateness earlier, we mentioned that in nature, your pup would be carnivorous. Wheat, soy, and corn are ingredients that your dog would never encounter in the wild and are mostly just used as cheap filler. Instead, look for high-quality ingredients like chickpeas, sweet potatoes, and brown rice. OK, so now you might be wondering why your dog even requires carbs in his diet. Carbs are a fantastic source of fiber, which helps keep your dog’s bowel healthy, as well as promoting a healthy weight. It also helps keep your dog feeling satisfied between feeds. Like us, dogs need a variety of vitamins and minerals to thrive. Important ones for German Shepherds definitely include glucosamine and chondroitin for bone and hip support. This is essential for preventing the painful aforementioned hip dysplasia that may plague your German Shepherd. Omega-3 and 6 essential fatty acids are also great to include in your dog’s kibble. Not only will they aid in cognitive function but they also promote heart health and healthy skin and coat. Prebiotics and probiotics ensure that your pets gut flora is balanced. They can also help him break down difficult ingredients, allowing your pooch to absorb all the nutrients your dog’s food is providing. Finally, fruit and vegetable sources of antioxidants will give your German Shepherd’s immune system a helping hand and keep him healthy and resistant to disease and infections. Like all living creatures, your German Shepherd will thrive from being properly hydrated. Make sure he always has access to a nice, fresh bowl of cold water and to change it out regularly. As previously stated, your German Shepherd (and, in fact, all dogs) does not need any wheat, soy, or corn filler in his food. These are cheap fillers that companies use to make more dog food without increasing the nutritional value. You can compare it to a bartender watering down drinks. You should also avoid any artificial flavors, colors, and preservatives. First of all, your dog doesn’t care what his food looks like. Secondly, it’s a dog parent’s responsibility to ensure that there are enough natural quality ingredients in their choice of food that the flavor doesn’t need to be enhanced with artificial flavoring. Most dogs aren’t that picky after all—they will eat a dead animal! Finally, you actually don’t want a food that will last indefinitely. Lots of different foods are made up of fresh or flash frozen real meats and you want a product that features as many real ingredients as possible. Some companies will also include ingredients that are not fit for human consumption, such as expired meat. You shouldn’t feed it to your dog if it is potentially dangerous to humans. German Shepherds are prone to their own set of unique health problems. We’ve mentioned it a couple of times because, sadly, it is a very prevalent condition in German shepherds. The well-known slope in a German Shepherd’s back causes hip dysplasia. Unfortunately, many breeders will try to enhance this “look” through breeding, which is only detrimental to the animal. Hip dysplasia is painful and can really take away from your dog’s quality of life. To attempt to avoid this problem, ensure your German Shepherd maintains a healthy body weight and try to include glucosamine, chondroitin, and MSM in some form in your dog’s diet. Like other large breeds with a deep chest, German Shepherds can suffer from bloat. Bloat is a serious, life-threatening condition that is frighteningly unknown among pet parents. If you notice you dog attempting to throw up but being unable to, pacing, and seemingly in general distress along with thick, stringy drooling, your dog’s stomach may have twisted, causing bloat. See a vet immediately. To help avoid bloat, feed him in as many small meals as is realistic. Also, restrict exercise before and after meals and ensure access to fresh, cold water. Finally, if you have a dog that really “wolfs” down his food, buy a special bowl that forces him to slow down, or spread his kibble out on the floor to make it a little more difficult to eat. Orijen is a big name in the dog food business and for good reason: Orijen uses real, high-quality ingredients. In fact 2/3 of the quality meats used in Orijen are either fresh or raw (which just means flash frozen). This grain-free food is composed of 85% meat and 15% fruits and veggies, which makes it biologically appropriate for your dog, which is a carnivore by nature. In fact, the first 10 ingredients in any Orijen food are meat or meat-based foods. Crafted in Canadian kitchens, Orijen utilizes every part of the animal, from flesh to organs to cartilage to ensure that your dog is consuming and absorbing the most nutrients possible. Because of this, Orijen only feels the need to include one supplement, which is Zinc. Zinc helps support the immune system, as well as promoting skin health for timely wound healing and finally helps maintain a healthy digestive tract. Orijen dog food also provides your dog with superior complex carbohydrates, such as squash, pumpkin, and beetroot which help keep his digestive system on track, as well as providing slow-burning energy to help him feel full and maintain energy levels between feedings. This dog food is also well-balanced for a German Shepherd: Ultra-high protein levels provide fuel and energy to keep your pup bouncing around and able to focus with reasonable fat content to ensure your dog maintains his healthy body weight. The Bottom Line? This dog food is expensive, but it’s worth the money for your German Shepherd. Not only is it made of the freshest and most high-quality ingredients, but it is also based on your dog’s ancestral diet, which means it naturally contains everything you need for a healthy dog. This grain-free dog food is based on your dog’s ancestral diet. High protein levels with more moderate fat content provide the energy your dog needs for his active lifestyle without putting him at risk of obesity or unhealthy weight gain. Variety is the spice of life and this dry dog food is available in several different flavor options and package sizes. On the subject of flavor, any pup is sure to scarf this tasty food down as it is made with real roasted meats, as well as high-quality sources of fiber such as sweet potatoes and peas. Not only does this help keep your dog’s tummy happy and operating smoothly, but it also ensures that your dog is able to sustain his high energy levels and activity between meals! Antioxidant ingredients such as blueberries help ward off disease and keep your pup’s immune system working at maximum capacity. This formula also contains Omega-3 and 6 fatty acids, which not only protect your best friend against heart disease but also keeps his skin and coat healthy. Finally, this formula contains naturally occurring probiotics, which will help keep their gut flora balanced and will help them digest. The Bottom Line? Taste of the Wild is an inexpensive brand you can count on. Their high-quality food is grain-free, as well as being high in protein with moderate fat content. Lots of flavors will keep your dogs palate healthy while antioxidants and probiotics will keep the rest of his body working at maximum capacity. Taste of the Wild dog food is an excellent option on a budget. This grain-free dog food is also chicken-free and gluten-free, making it a great option for an allergic German Shepherd or one with a sensitive stomach. 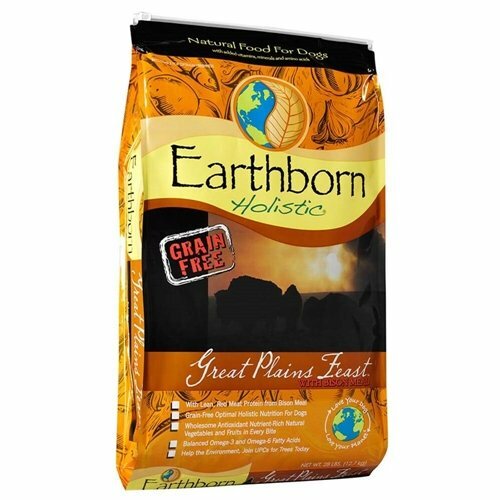 This holistic, yet affordable dog food brand also contains Omega-3 and Omega-6 fatty acids. These acids are helpful in maintaining a healthy heart and also help to keep skin moisturized and your pup’s coat shiny, healthy and manageable. 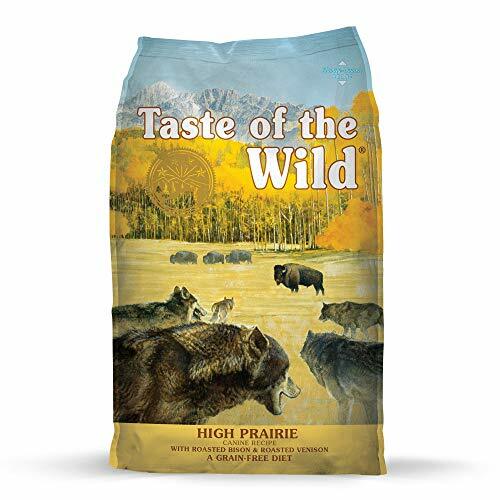 This dog food is high in protein derived from red meat, namely bison and lamb meals that contain up to 3 times the protein content that regular meat does. It also contains egg proteins. Lots of protein and more moderate fat content will help your dog develop strong, lean muscle and help him shed extra weight if he needs to! Every gulp of this tasty food will provide your dog with fruit and vegetable-based fiber as well as antioxidants, which help your pup, fight off disease and infection and keep his immune system functioning properly. The addition of l-carnitine also allows your dogs to easily turn excess fat into muscle, which will help him keep off extra pounds and benefit his overall health. The Bottom Line? If your dog has a sensitive tummy or suffers from allergies, this food may rock his metaphorical socks off! Not only is it delicious but also it is also grain, gluten, and chicken-free. It contains high protein to sustain an active dog but lower fat to help keep the weight off as your pup ages and high-quality complex carbs to keep your dog energetic all day and feeling satisfied between meals. Beyond that, it’s enriched with lots of extra nutrients to benefit your pup’s overall health. 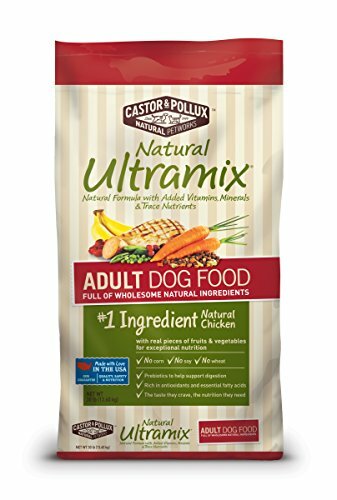 Ultramix dog food is made in the USA, so you can be sure that your pup’s food meets American standards. This food is corn, wheat, and soy-free, as well as being free or artificial flavoring, colors, and preservatives. This formula has a moderate protein level to sustain your active dog, as well as having a low-to-moderate fat content for weight control. Added Omega-3 and Omega-6 fatty acids promote heart, skin health, promise a silky, and a luscious coat, while prebiotics aid in digestion, and help keep your dog’s gut flora balanced. Fruit and vegetable antioxidant super foods, in the kibble but also in whole pieces in the food, not only protect your dog from disease and boost its immune system but also provide fiber and the complex carbohydrates your dog needs to feel full and satisfied and maintain energy levels throughout the day. The addition of calcium and phosphorous keep bones strong and healthy well into old age and, combined with the hardness of the kibble, it will maintain good oral health as well. The Bottom Line? This dog food is reasonably priced but will meet your dog’s nutritional needs. Free of harmful additives that your dog would never encounter in the wild, this food also promotes healthy body mass with a lower fat content than other foods. Added nutrients, such as fatty acids, live cultures, and calcium will help your dog maintain good all around health while real chunks of fruits and vegetables with antioxidant properties will do wonder for your pup’s immune system. This grain-free dry dog food from Nulo also contains no chicken or egg proteins, so if you’re the parent of an allergenic pet, listen up! These yummy morsels are also wheat, corn, and soy-free and are biologically appropriate for your carnivorous canine. This tasty dog food comes in three different flavors and is coated in a probiotic solution to help keep your dog’s tummy happy and aid him in digesting his food. This process also ensures that your pet is fully absorbing nutrients from his food. Zinc and iron from lean, red meat protein sources help support immune system health with an extra boost from natural antioxidants like blueberries. Real meat protein sources also contribute amino acids, which work toward improving heart health and controlling weight by promoting lean muscle growth. High-protein content but moderate fat ensures your dog isn’t packing on the extra pounds, but has enough energy to sustain him throughout his active day. Slow-burning complex carbs like carrots and apples also help him feel full and remain energetic while providing fiber to help keep his bowels in tiptop shape. Omega-3 and Omega-6 fatty acids guarantee a healthy coat and will make itchy flaky skin a thing of the past. Finally, you can rest assured that Nulo meets the same standard you have for your pet as it is made in the USA. The Bottom Line? This dog food is expensive but is also virtually hypoallergenic. It also contains no harmful fillers and is enriched with a variety of different nutrients for optimal all-around health. 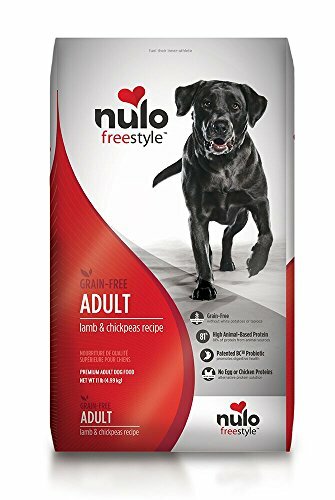 If you’re looking for a safe dog food option for your sensitive pet or pets, you may have found your dream food with Nulo. Which dog food you choose truly depends on you and your dog. Consider budget and your German Shepherd’s taste buds while shopping. Also, use your judgment. If your dog is not allergic to chicken and has no adverse reactions, of course, you shouldn’t discriminate against the products on this list that contain chicken. It may take some trial and error because every dog is different, but we are confident that this list will set you on track for finding the best food for your German Shepherd! Where can I purchase small quantities/samples of these foods? I don’t want to experiment by spending a lot of money on a whole (26 lb) bag only to discover it’s not the right food because the dog is allergic or doesn’t like it. We have a tight budget, but want to do right by our rescue. I don’t have money to waste or to donate to a shelter. Veterinarians offer free dog food samples of certain dog food brands that help with specific health conditions like kidney disease and digestive problems. Dog food manufacturers can also be contacted, and offer dog food samples. Social networking pages often promote new dog food products, and will provide an online coupon to use at stores or online. Pet stores will also offer samples if you ask them. Newspaper coupons will promote a brand and offer free trial sizes. It’s best to always consult with your veterinarian for advice if your dog suffers from a health condition, prior to switching over to a new brand of dog food. That said, when switching over, do so slowly, by adding in a small amount of the new dog food, to the one that your dog is currently on. Foods that are high in zinc include red meat,seafood,poultry,and dairy. Zinc deficiencies in dogs often show up as zinc responsive dermatosis. There are also some breeds that have hereditary zinc deficiencies like German Shorthaired Pointers, Huskies and Alaskan Malamutes. This condition is responsive to supplemental zinc. Symptoms may include thickened skin on the legs, and pustules within the mucous membranes. Females may seem as if they are going into heat or have similar symptoms associated with lactation and whelping. With zinc deficiencies, it is common to have secondary infections. Your veterinarian will do a skin biopsy. It is always best to work together with your veterinarian to get the best dietary advice for your dog.Some brands are better suited for certain dogs. Your veterinarian understands your dog’s current medical needs, and should be able to advise you on the best dog food or home- cooked recipes for your dog. Are there any other comments from thos consumers of Origen dog food since they have moved their manufacturing plant from Canada to Kentucky? I have read on other sites, amazon consumer comments which say that their pets have been sick with the diarrhea, vomiting and anorexia along with changes in the appearance of their coats since they tried this food from the new location! 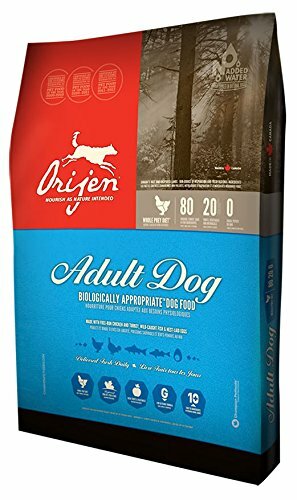 Orijen is a high-quality dog food that has awesome reviews on Amazon. Thanks for connecting to Mysweetpuppy.net. Please keep in mind that I, Claudia Bensimoun, do not write any of the blogs or reviews on this website, nor have I in the past. I only answer the comments section.Please consult with your veterinarian. Your dog could have food allergies, or be allergic to something else within your household. Your Shepherd may also be shedding, and some breeds like the Shepherd shed more excessively than other dog breeds. If the hair is falling out in small patches, it may be due to ringworm. If in large patches, this could be due to hyperthyroidism. There is also the possibility of sarcoptic mange, fleas, and other parasites that could be causing hair loss in your dog. Please visit your veterinarian for a check-up. Thnaks again for reaching out! Please keep us updated. Thanks for connecting to Mysweetpuppy.net. Please keep in mind that I, Claudia Bensimoun, do not write any of the blogs or reviews on this website, nor have I in the past. I only answer the comments section.A large 30 pound bag will generally run between $48.00 to $56.00. You can search for prices if you click on the link provided within the blog. This dog food brand is very affordable, and rates between a 4 or 5 out of 5 stars rating on Amazon. Thanks for connecting to Mysweetpuppy.net. Please keep in mind that I, Claudia Bensimoun, do not write any of the blogs or reviews on this website, nor have I in the past. I only answer the comments section.Thanks for reaching out. Taste of the Wild Pacific Stream Canine with Smoke Salmon is a high-quality dog food formula.For those dog lovers wishing to ensure digestive health in their dogs, Taste of the Wild uses guaranteed probiotics. This is a great product for dogs suffering from digestive health issues. With sweet potatoes – a good source of dietary fiber- as its third ingredient, this dog food is packed with antioxidants, and offers a high source of vitamin E. Sweet potatoes contain many important nutrients, and include vitamins A, B6 and C, calcium, folate, copper, thiamine, iron and potassium. The first five ingredients listed are salmon, ocean fishmeal, sweet potatoes, canola oil and salmon meal, so your dog will be consuming enough omega-3 fatty acids. This is also excellent for anxious or stressed out dogs. It does contain canola oil which some may consider an unhealthy fat. The salmon formula contains no chicken for dogs that have demonstrated a chicken allergy. Keep in mind that there is no best diet since each each individual dog will have different dietary needs. It’s best to consult with your veterinarian for the best nutritional advice. Thanks for connecting to Mysweetpuppy.net. Please keep in mind that I, Claudia Bensimoun, do not write any of the blogs or reviews on this website, nor have I in the past. I only answer the comments section.At Mysweetpuppy.net we review dog foods and dog products. The “Top 5 Best Dog Foods For German Shepherds,” reviews Orijen, Taste of the Wild, Natural Ultramix, and Nulo among others. Like people, dogs have unique needs, and we reviewed the best nutritional dog foods after hours of research. Dogs, like people, have individual needs, and every dog’s nutrition requirements are unique depending on the breed, age, weight, and activity level of the dog. A dog food that works for one dog may not work for another. A Border Collie who trains for agility needs many more calories than the Chihuahua that enjoys cuddling next to you.All dog foods are regulated by the Food and Drug Administration (FDA), the U.S. Department of Agriculture, and the Individual State Department of Agriculture. That said, it’s The Association of American Feed Controls (AAFCO) that provides guidelines for the manufacturing, selling, and labeling of pet foods to ensure pet safety. AAFCO also dictates the levels of nutrients that should be used for each life stage. A well-balanced dog food should use real meat as its first ingredient. It should also not use harmful preservatives, flavors or artificial colors. As usual always consult with your veterinarian before switching dog food formulas.The dog food formula should indicate what life stage it is intended for. AAFCO provides nutrient profiles for all different life stages, all but for one, the senior geriatric dog. General ingredients that include whole meats, fruits or vegetables in their top 5 ingredients are considered good foods. Those that also incorporate antioxidants like blueberries, cranberries, pomegranates and pumpkin are also becoming popular. With that said, organic, natural and preservative- free with no artificial ingredients, are also key to a well- balanced, and high quality dog food.Always ask yourself these questions: Is my dog suffering from any health problems? What life stage is he or she at? Veterinarians recommend that pet parents have a better understanding of their dog’s health issues and life stage before choosing a dog food. That said, there is no “best diet”- dogs are all individuals. A diet that works for one dog, may not be great for another. Age, energy level and individual medical concerns play a large role for each dog. Dog food formulas that offer glucosamine and chondroitin for hip and joint wellness are beneficial to dogs. Just as we choose different diets to suit our own lifestyles and life stages, the same should be done for our dogs. It’s also wise to examine the nutritional benefits of the dog food that you’re currently feeding. Jot down all the ingredients, caloric content, protein and fat levels, and question whether your dog is currently suffering from any health problems like itchy skin, bloat or diarrhea. Your next step will be to find the ideal food for your dog. That said, always consult with your veterinarian as to the best nutritional advice. Even if you’ve been feeding your dog the same dog food formula for years, you’ll probably not notice the changes, like using chicken meal instead of whole chicken, or changes in the type of carbohydrates used.You should always read the ingredients list to note changes, if any in the formula. This could affect your dog in many ways, triggering allergies and sensitivities that he or she may have never had before. Protein percentages can also drop when formulas are changed. This happens often, and does affect the quality of the food. The addition of cellulase and cellulose as fillers can be problematic. For those unaware, cellulase breaks down cellulose. Many dogs have problems with both because it causes digestive problems.